This is the ultimate in a cosmetic dental make-over. Many cosmetic dental problems can be permanently resolved with porcelain veneers. Whether you have chipped, gapped, stained or mis-aligned teeth, this is the answer. This wafer-thin porcelain is form-fitted to each individual problem tooth. As strong as one's own teeth, these veneers resist future discoloration and chipping. Only one or two visits are required to have the perfect smile. Dental bonding is a special resin composite that adheres to teeth and becomes as hard as enamel. Whatever the problem, the teeth can be bonded for a reshaped smile in as little as one office visit. The color of the bonding material matches the patients own teeth to assure a natural look. This may require getting the patients teeth to a pleasing color first, through whitening or other services. Family & Costmetic Dentistry offers at-home whitening treatments. Whitening a patient's teeth, removes the appearance of coffee and tobacco stains and improves the color of aging, yellowing teeth. Home whitening requires an initial visit to fit the teeth with two custom-made trays. These clear plastic trays hold a gel that whitens a patient's teeth in seven to fourteen days. Patients can wear the trays overnight or more often in order to speed the process. The computer has arrived for dental X-Rays. 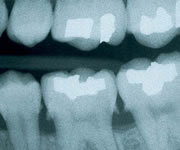 It utilizes 90% LESS radiation than conventional film-based X-Rays. The results are instantly available, and the large monitor allows for a more detailed analysis of the problem teeth. A great smile starts with great oral hygiene. Family & Cosmetic Dentistry offers basic services like cleaning, enamel-colored fillings and porcelain crowns. As an alternative to metal-based caps or crowns, we use ceramic onlays to cap only the part of the tooth that is broken. A patient can also get a comprehensive oral health evaluation. We also provide reliable advice and practical options including how to attain and preserve a healthy and youthful-looking smile. Many times no single procedure can solve a patient's problem. Sometimes it is necessary to utilize two or more treatments to maximize results.